Singers Richard Perlmutter, lead vocals; Elin Carlson, soprano, Susan Boyd, alto; Jonathan Mack, tenor; Michael Geiger, bass; Jon Joyce, bass. Plus various guest performers. Orchestras United States Marine Band, New Zealand Symphony Orchestra, Royal Swedish Airforce Band, Polish State Philharmonic Orchestra. Plus various guest performers and soloists. In this concept album, Perlmutter sets his inventive lyrics to famous classical pieces written for dances, marches and processionals. Included are Perlmutter's take on "Pomp and Circumstance," the famous theme played at every graduation. And lyrics for a minuet, polka, waltz, ballet, habanera, and both a military and circus march. This is the first Beethoven's Wig album to feature compositions by two American composers, Scott Joplin and John Philip Sousa. Favorites are "Midnight Snack," the story about a desperate attempt to sneak into the kitchen for a gigantic feast. And "Oh No," about the rescue of a poor damsel tied to the railroad tracks, set to the best selling ragtime piece of all time, "Maple Leaf Rag." It could be the musical sound track to a silent movie. "Please Mr. Ringmaster" and "Forever We're Marching" are Perlmutter's take on two of the most famous marches of all time, one a cry for help from a poor lad who ran off to join the circus, and the other a lament from the members of a marching band. There is also a bonus track on Beethoven's Wig 4, "Beep Beep Beep" the story of a late night traffic jam set to Beethoven's "Moonlight Sonata." It's an all time favorite of audiences and critics, and of the hosts of NPR's "Car Talk" who play it on their show and are including it on one of their Car Talk Greatest Hits albums. 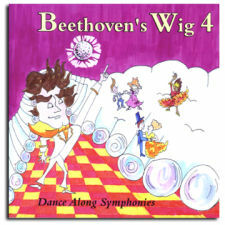 On Beethoven's Wig 4, as on number 3, Perlmutter's son Sammy did the cover art and booklet illustrations. And Perlmutter's brother Tom did the booklet layout and graphics! Beethoven's Wig 4 also features Perlmuter himself playing piano on two of the pieces, "Maple Leaf Rag," and Bach's "Minuet in G." Gee!!! This album won Beethoven's Wig its fourth nomination for a Grammy Award, and earned Perlmutter another American Library Association "Notable Recording" honor. To quote a reviewer, "How Beethoven's Wig managed to maintain the charm of the original but also maintain this level of artistry amazes me. Highly recommended!"